The Itsy Bitsy Spill: Whoooo Hoooo I'm featured here! Whoooo Hoooo I'm featured here! 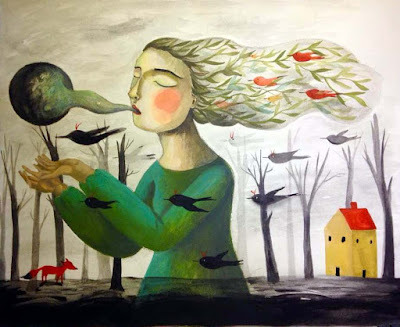 If I had to describe Magaly Ohika’s art in one word, well, I couldn’t. But several come to mind: fun, colorful, whimsical, detailed, unique…I could go on. See for yourself at her etsy shop, The Itsy Bitsy Spill. It’s my pleasure to host her on Stitch Freak—our first artist interview! When did you start doing needlework and why? I first began sewing when I was in college. I was a toy designer then. I created plushes for toy companies. Then, a few years later, I saw the most beautiful embroidery needlework from several artists who I came to admire. They inspired me to create and explore more with needlework. And I got myself more involve in it and it was absolute fun! I became more fascinated when I realized I can do a combination of things like mix media. It was limitless. My creativity and inspiration whimsically escalated. I started to use paper, fabric, buttons, anything I can find for my pieces. Even though I was excited by the exploration of needle work, something was missing—doodling. I wanted to draw on fabric and wanted to learn how. I got myself a darning foot that allowed me to doodle freely in my sewing machine. At first it was tricky. 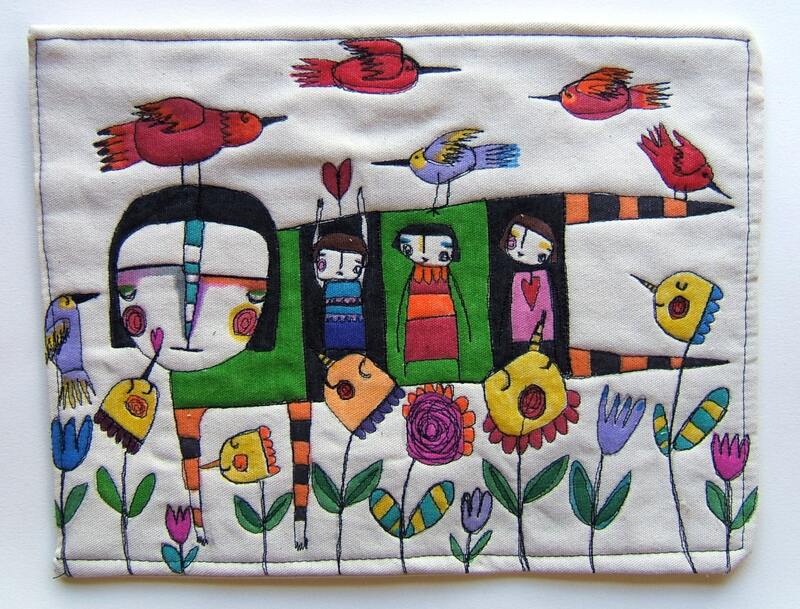 Cathy Cullis’ work inspired me to explore embroidery art! And it all began with art in stitches! Flow art—my work is very whimsical and childlike. It’s free! Children, nature, and anything emotional. I channel myself through art by allowing myself to simply feel it all. Belly laughed, hmmmm! If you mean laughing so hard I can hardly contain myself…Let’s see! I don’t quite remember the last time I laughed like that. I had several moments when I laughed purely out of joy. Watching dogs play, children interact, my mother telling me funny stories or my husband doing funny gestures. Where do you do your needlework (in a sewing room, on your patio, in front of the TV, etc.)? In my art studio. My cat and dogs are with me when I create. Ok, you’re stranded on a desert island. Which five items do you hope to have with you? What is your favorite kind of needlework to do (or your favorite item to embroider)? Drawing with my sewing machine—darning foot and canvas fabric. I know you use other media in addition to needle and thread/sewing machine. Tell us about your other work. I’m very diverse in my art. I love to learn and grow when creating. I love, love to paint. It is my passion to create and simply be myself. Last but never least, is making people feel happy when they receive my art. That is very important to me. To bring a smile and warm their hearts! I love reading about you and seeing all your fabulous Art. WONDERFUL!!!!!!!!!!!!!! That pretty much describes you and your artwork, sweet little muchacha. Congrats!